You are currently browsing the tag archive for the ‘Kasubi Tombs’ tag. Throughout the last couple days, I’ve been checking lots of different news sites to monitor how things are going in Kasubi. When I went to bed on Tuesday night, I feared what I would read in the next day’s paper. I suppose the news from Kampala is both bad: some unrest around the tombs, with 3 people killed by security personnel; and good: no reports of widespread violence or rioting. I have noticed, mostly on the Daily Monitor’s Facebook fan page, and in comments in newspaper articles, a theme of empathy and shared loss expressed by people not just of the Buganda tribe, but by Acholis and other groups from around the country. This brings me a bit of hope that perhaps trust is growing between ethnic groups in Uganda. Along with reading the articles, I’ve been trolling the photos and videos, hoping to not see any familiar faces. I continue to hope that many of my neighbors had the chance to avoid the chaos around the tombs. Jon and I plan to call friends from the area tomorrow to check in with them. 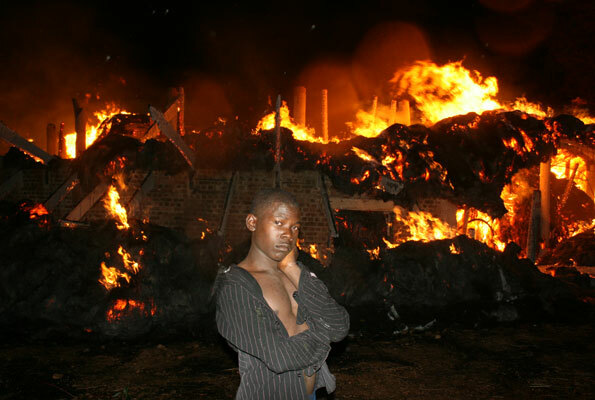 People in Uganda (and those watching from elsewhere) continue to wonder about who (if anyone) was behind the fire. A friend shared this Al Jazeera clip with me, and it discusses the steps that various parties are taking to start investigations. It also highlights a lot of the issues going on in Uganda at the moment, and provides some good context. Uganda has truly lost an important piece of its cultural heritage. As best as I can tell, it doesn’t look like it’s lost its (hard-fought and precariously maintained) social cohesion. I hope that that can continue, and that rebuilding the Tombs provides an opportunity to grow empathy and trust between Ugandan communities. It is almost 11 on a Tuesday night, and I should be reading, writing, and applying to jobs. Instead, I am extremely distracted. Not by the singing revelers outside my window, welcoming St. Patrick’s Day a couple hours early – although, that is a bit distracting. It’s this news that the Kasubi Tombs, in Kampala, have burned down tonight. The Kasubi Tombs as they burn. Photo by Joseph Kiggundu, Daily Monitor. 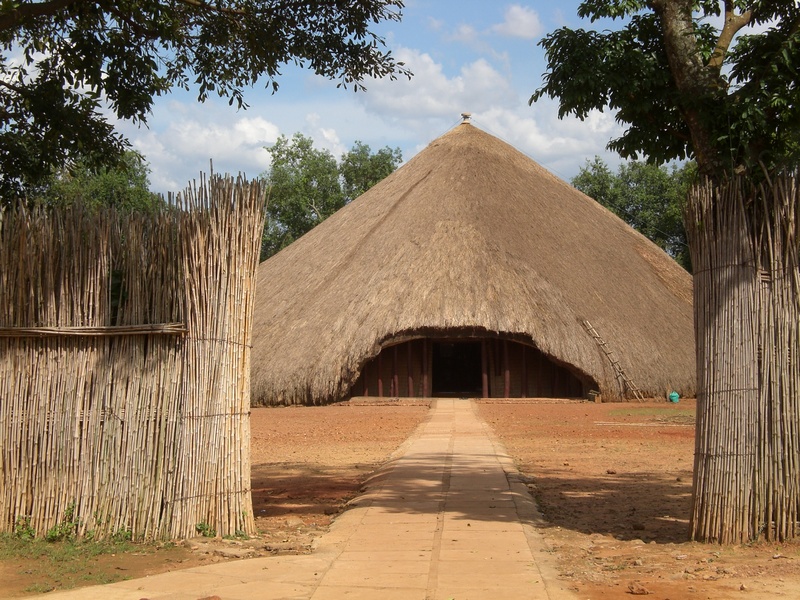 The Kasubi Tombs are more than important cultural and historic structures to me. When we lived in Uganda, they were my neighbors. Our apartment was at the bottom of Kasubi Hill, and we passed the Tombs every day to and from downtown Kampala. We took numerous visitors to see the tombs to learn more about the Buganda tribe, its history and culture. I always loved passing the guards of the Tombs; dressed in the traditional saffron-colored robe and leaning against the big tree out front, they waited patiently to greet the next set of visitors. Nobody knows yet why the Tombs went up in flames. I’ve already seen a couple of theories floating around online. None of the theories involve an accident. In the last several months, there has been much tension between the ruling party, the NRM, and the Buganda kingdom, relating to a land dispute. Riots in October went on for about two weeks and killed a number of people and damaged property all over Kampala. It is easy to draw a connection between this earlier dispute and tonight’s fire. If this theory proves to be true, it could mean a fresh set of riots and worsening ethnic tensions. Another theory revolves around more recent news. Just last night, a security guard opened fire on students at a hostel near Makerere University. Two students were killed – both were Kenyan. Today, students protested at Makerere and through the surrounding neighborhoods. Could this be related to the Tombs burning? Or, was the fire just an accident? Setting aside the question of how this could happen, my mind has been racing thinking of my friends and acquaintances in Kasubi. Were our boda boda-driving friends there to witness this important site being burned to the ground? What is happening in the neighborhood now – any rioting or general panic? How are John and Gladys and Alex and Mabel? What will happen tomorrow? For the moment, all I can do is send positive thoughts their way. And attempt to dust off the distraction and try to get back to work.